Well what a day it has been. 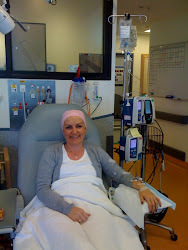 Today was my '3 weekly' trip to the hospital for my dose of IV herceptin at the oncology unit. The girls were at a friends where they had their holiday moviethon - this holiday the theme was mermaids - so all was red and blue. Red as Aeriels hair and blue as the sea. So mum and I headed off to hospital just the 2 of us. I was due to start at 9.30 but when we arrived the unit was very busy. I was due to go to radiotherapy after for another zapping. When I hadn't been called in after 10 I had a feeling it would be one of those days!! The staff were as friendly as ever but very busy and a few staff down. I have been having some discomfort in my chest these last 2 weeks - I have attributed that to heartburn linked to the radiotherapy. The staff wanted to doublecheck my heart just to be sure - so I had an ECG. There were a few problems in getting it set up but I am pleased to say that the results were fine and the Dr was happy to go ahead. Unfortunately the first attempt at getting a line up was unsuccessful and extremely painful - so I was left with a heat pack on my arm . Another staff member was called to give it another go - thankfully she is a whizz and she had success. I was running so far behind by this stage that I had to phone radiotherapy to change my appointment to later in the day. My appointment at oncology should have been about an hour - but instead I was there for about 3!! It was then back in the car and off to get the girls. Miss C also had an appointment at the dentist at 3 so we were all going to head down to radiotherapy and then on to the dentist!! My friend who had had them had tea and lunch waiting for us. What a blessing - so we munched it down and off we went again. We were cutting it fine and on arriving I flew into the change room and through my strippy gown on as quickly as possible!!! This is no 14 today so the rads chap noticed I wasn't my usual self and asked why I seemed a bit flustered today! I explained how my day was going so far and he said well at least here you can lie down and catch your breath. Haha he was right !! So after catching my breath - it was out of the stripes and into my own clothes and back into the car and onto the dentist!! Poor Miss C has a wiggly tooth - this has allowed a bit of infection to get in underneath and her tooth was not coming out easily so we went to have it taken out! When we went into the dentist she showed me how up above another tooth was breaking through the side of the gum as the baby tooth below was holding fast. So it was recommended that it was removed also. Oh my poor Miss C - 2 teeth out in one go. Now if you know me you will appreciate that I do not enjoy going to the dentist at the best of times - and after the first part of the day my resolve was not great!! Out came the happy gas - for Miss C - hmm I wouldn't have minded a few puffs hehe!! The area was numbed and we were under way. Poor Miss C was quite upset about the whole business - I know that her resolve is also lower with all that is going on. When the dentist asked me if she was usually this way or if it was more related to my breast cancer - that was me. I nodded and my eyes welled up with tears . Before long some had escaped down my cheeks - I was trying hard to hold it together to keep Miss C as calm as possible. The dentist was lovely and very soon all was done. Afterwards the dentist asked if I was okay - I laughed and said I had been fine until she had asked if Miss C was struggling with my diagnosis. We had a lovely chat and soon she and I both had teary eyes - I said we better sort ourselves out before going into the reception area or any patients waiting would not be staying long - they would all be running out the door seeing all of us with teary eyes!!!! I was also very touched that she had seen past Miss C immediate response and recognised what was really affecting her. So that was our last stop for the day. I was very relieved to be climbing into the car and heading home!! So now the troops are in bed - as am I.
I must say that as nice as the medical people are that I come into regular contact with on this journey - there are days when you don't really want to be seeing them at all. The surgeon had said right at the start that the next year will be more or less taken over by dealing with my diagnosis - he wasn't joking!! Travelling in a time machine to the end of that would be pretty appealing right now!! Well thankfully tomorrow is my last radiation of the week and I have 2 days zap free - yeeha!! We are seeing a few friends over the weekend - mostly as they want to see mum before she goes back home. This will be her last weekend with us - it doesn't bear thinking about really!!! She has been an amazing support and comfort these last weeks and I am so thankful she has been able to be here at this time. Your strength and love have guided me and given me wings to fly ! !